It’s been a hot beginning of the summer in most of the US farmlands, with rain inundating some regions. Corn farmers whose common colloquial phrase is “knee high by the fourth of July” are now determining how many of their crops were affected by partial flooding. Even with careful planning, conservation, and hard work, unexpected events sometimes offer setbacks. Does that mean that they stop working? No. Farmers are creative and flexible. They have ways of making the best of situations with techniques such as crop rotation, tilling, and utilization of different seed strains. But the key ingredient to make all of these plans effective is the focused attention of the farmer. There is no substitute for actually doing the work, and then letting time and weather conditions do their job. A good harvest takes planning, dedication, and time. Contrast this wisdom with the viewpoints of some crypto day traders; I’ve run across a few who are so unbelievably impatient, I have to believe they are completely unfamiliar with how much time and work is involved in building out networks, systems, and stakeholder companies. Even the best ideas take some amount of time to go from planning stages to execution. But the common day trader doesn’t care much for long-term plans and potential. They want to see harvested crops, no matter if it’s in May or June. In the case of XRP, its use cases pertaining to liquidity are just getting started. Remittance processing companies are implementing it for cross-border transfer, and four companies have positively confirmed the cost-saving results in their respective pilots of xRapid. xRapid is Ripple's solution for sourcing liqudity dynamically with XRP through exchanges. It's getting closer to harvest time for XRP holders, and those that have held the longest have done so against the fear, uncertainty, and doubt that goes along with the crypto markets. While risk taking is something that each person must judge individually, I hold to the perspective that those that take the biggest risks - and work the hardest to create their own 'luck' - will realize the greatest rewards. Recently, I blogged about the Swiss stock exchange, SIX, getting into the crypto space with a new exchange that was being positioned to support tokenization of existing securities. The development heralded a move by mainstream finance to finally enter crypto en masse. Another company – this one the second largest exchange in Germany, and the ninth largest in Europe – is planning on allowing its customers to start trading in cryptocurrency shortly. The name of the exchange is Börse Stuttgart, and their mobile application’s name is Bison. 1 Because their new trade platform is mobile, its convenience will likely be an attractive target for busy investors who are crypto trading ‘on the side’ in Germany and Europe. The big news item for Ripple is undoubtedly the promotion of David Schwartz to the role of Chief Technical Officer, or CTO. Ripple's previous CTO, Stefan Thomas, recently left Ripple to start his own company, Coil. “Building a global network of financial institutions who are using blockchain-based solutions is no small task, but we have the technical folks at Ripple to make it a reality. We’re also going to hire a lot more of them. As usual, David Schwartz doesn’t disappoint, and his promotion to CTO was welcome news. While some may miss his personal architectural and development input at a code level, it’s great that he’s taking on an important mantle of leadership for Ripple. Congratulations again to David Schwartz – and Ripple. I couldn’t agree more with this statement. Ripple technology – both their ILP-based solutions and their XRP-Ledger-centric liquidity solutions – have the potential to supercharge global commerce. Question: You’ve spent your career working to improve access to and delivery of financial services worldwide. What do you think is the most challenging issue in payments today? ...No doubt banks and other financial institutions have world-class regulatory, compliance and risk management capabilities. Companies like Facebook have improved access to services, digitized payment flows and made it quicker and easier for people to transact with each other domestically. Now we need a new global technology solution for international payments that offers interoperability with existing systems, connecting them and leveraging their value. In the same biography & interview article, it notes that Kahina Van Dyke worked in some capacity to connect with teams from Mastercard, Citibank, Facebook, PayPal, TD Ameritrade, Western Union, and Visa. It's an impressive list to say the least. 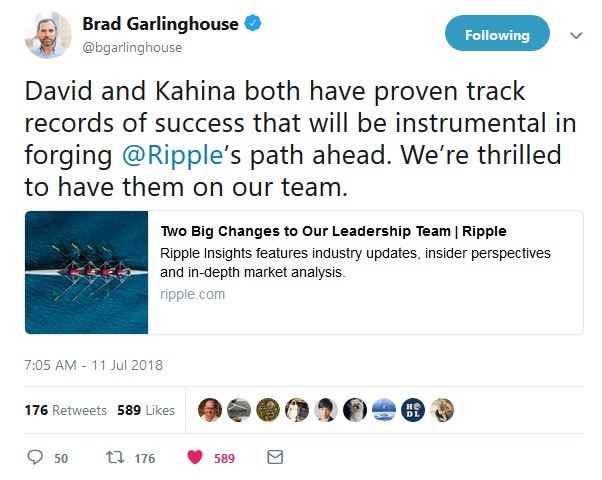 I predict that Kahina Van Dyke will help Ripple reach influential new business partners and customers. It may seem like common sense to everybody that does even a minimal amount of searching and research using Google or Wikipedia, but it’s one more step in a series of high-profile decisions to separate Ripple from its use of the decentralized cryptocurrency XRP. While XRP is certainly a cornerstone of Ripple’s liquidity sourcing solution, xRapid, it existed before the company, and doesn’t need Ripple to continue its existence. XRP is a decentralized cryptocurrency, and anybody can build applications that use its network. At the Wharton School presentation recently, Asheesh Birla talked a bit about how regulation and general uncertainty have dissuaded some banks from stepping into digital assets. This comment had two gems that XRP community members immediately identified; the fact that Ripple was going to be more assertive in pushing for regulatory guidance, and even further, that Ripple envisions not hundreds of banks, but thousands, signing onto RippleNet. The goal is to ensure that regulation is not an obstacle for Ripple’s solutions; remember that one of those solutions - xRapid - utilizes XRP for sourcing liquidity. The comment was made in reference to regulation, but it also reinforced the belief that Ripple is not aiming for a portion of the correspondence banking market. They are seeking to be the number one choice apart from SWIFT. It’s one more data point when crypto researchers seek to derive Ripple’s high-level business plan for the next two years. 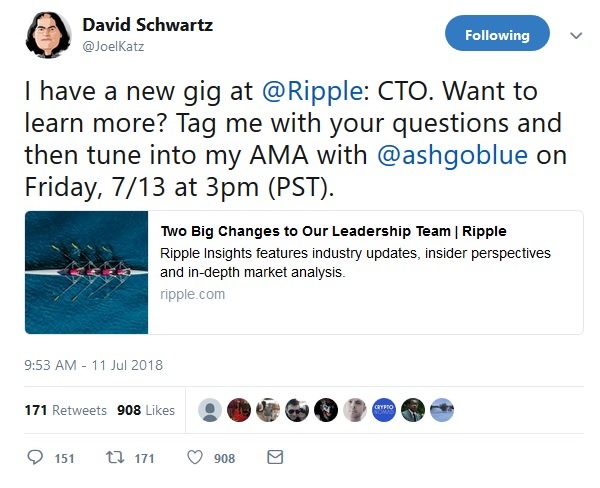 While it’s an AMA session, I expect that many of the questions will pertain to the new role that David Schwartz is taking with Ripple. As indicated in his tweet, David Schwartz is inviting any interested parties to submit their questions to him via tweet response. To see some of the questions already submitted, click on the previous tweet to view it on Twitter. From that point onward, July 10th was designated as “Jet Fuel Day” for the XRP Community. 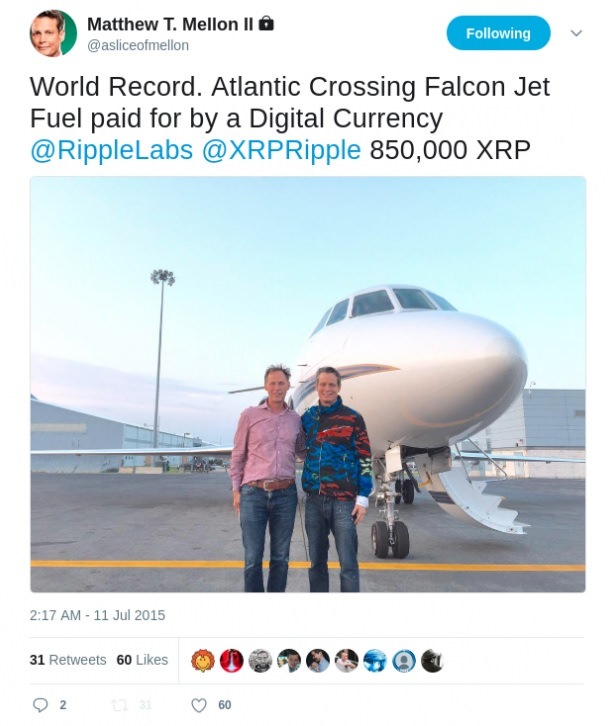 When Matthew Mellon passed, the XRP Community lost a capable champion that knew how to promote new ideas with flair; while other, even more high-profile celebrities have taken the torch and carried it on, it’s good for us to stop and remember a financial industry visionary who saw through the clutter and noise in blockchain technology as far back as 2015. The dependable, clockwork performance of the XRP Ledger is something that is making an impact on remittance companies and banks alike. Many new crypto networks continually tout their creations, but when it comes to a reliable, time-tested cryptographic network, it’s hard to argue with the metrics of XRP, collected and measured over the course of its six-year history. On June 23rd, I covered the major news regarding the start of the XRP “recommended UNL” decentralization. The recommended unique node list is merely that – a recommendation to those running XRP Validator nodes about which other nodes they should trust as part of a default configuration. 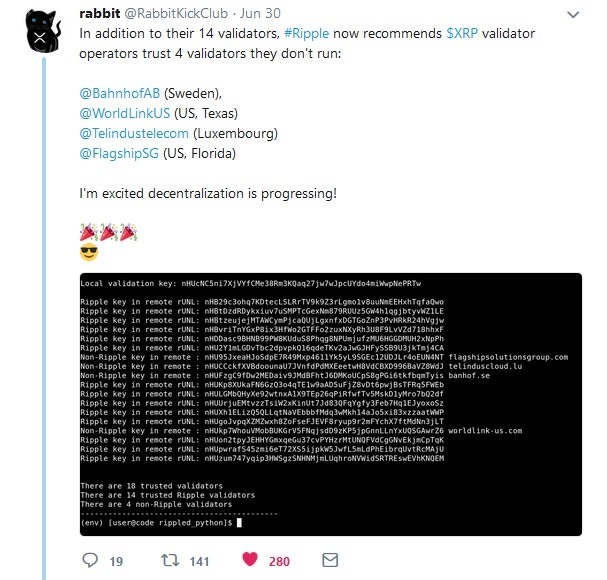 However, even though it’s only a recommendation, and validators can choose to trust any other validator, the fact that each of the recommended unique node list participants were validators operated by Ripple has invited criticism – founded or unfounded. The non-Ripple members of the recommended UNL now include validators from Sweden, Luxembourg, Florida (US) and Texas (US). This further diversity in the list is evidence that Ripple is preparing to follow through on their goal of full XRP Ledger decentralization in 2018; we are roughly half-way through the year, so expect to see more non-Ripple, attested validators added to the list as the year continues. 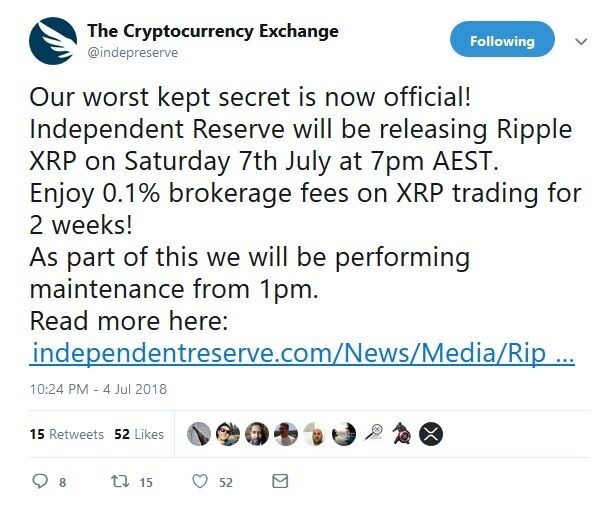 As part of their promotion to jump-start XRP trading on the exchange, they’re offering reduced brokerage fees. The number of Codius hosts is climbing, along with the number of smart contracts in the Codius ecosystem; the crypto development community is diving into smart contracts and seeds are now being planted for the next generation of digital assets, contracts, derivatives, and decentralized applications. There are many companies that build on the XRP Ledger, both here in the United States, and abroad. And there are many companies that, through their association with Ripple, are also stakeholders in the health of the XRP Ledger, due to their usage of xRapid. These remittance processors and banks will be the first organizations to realize the payment processing cost savings associated with using XRP. 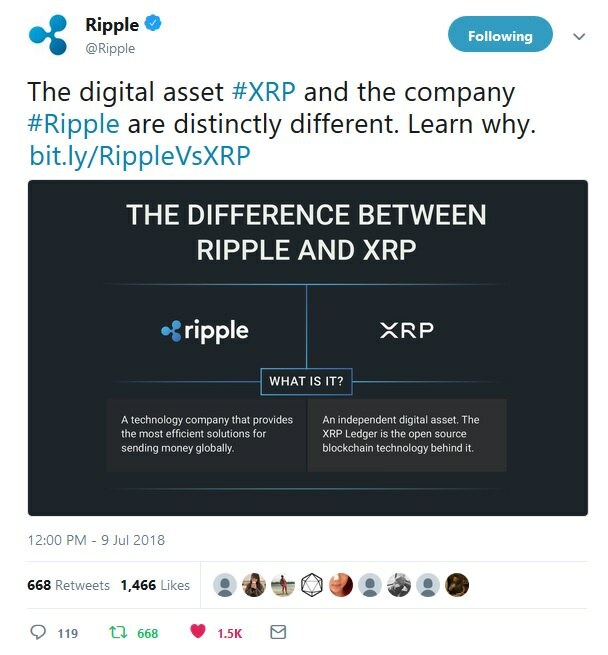 It takes a combination of foresight, commitment, risk-taking, and hard work to make the leap from traditional correspondence banking to using a digital asset for transferring value; and now we've seen that Ripple is dedicating resources to building a team to smooth out regulatory concerns by banks and other potential customers of xRapid. Ripple is working hard to build a truly scalable international banking network, while most others in the blockchain space are floundering, looking to cash in on revenue from new coins rather than solving real business problems. Coil is aiming to transform the very nature of content delivery on the Internet, but it's doing it right by first seeking to establish the Web Monetization standard for automatic micropayments from a browser. This is the hard work of solving real business problems with transformative technology. XRP's value doesn't lie with the whims of traders in the crypto market. It should be judged separately on its own merits instead of being arbitrarily - and mistakenly - linked with wasteful, environment-damaging proof-of-work systems such as Bitcoin and Ethereum. XRP's utility is based on use cases that have taken years to build and streamline; it's no coincidence that we're on the cusp of seeing utility-driven demand for XRP. From what I've seen, most members of the XRP Community - and XRP stakeholder companies like Ripple and Coil - seem to live by that maxim. Dipping toes into the crypto scene? XRP is where you begin.